Still the largest pumpkin I’ve ever seen. 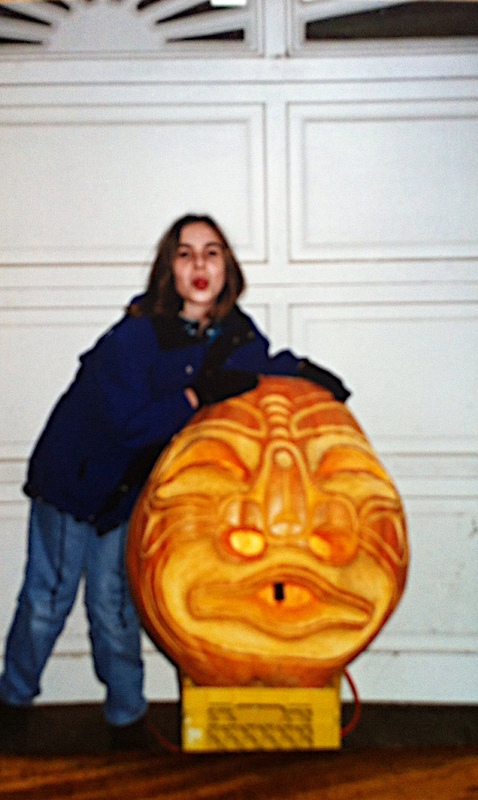 When I was 12 years old, I won a pumpkin. Not just any pumpkin — a really, really big pumpkin. Our school principal had grown a pumpkin of monstrous proportions in his garden that year, and he decided to offer it as a prize in a school contest. To win it, we had to guess its weight in kilograms. I guessed the monster pumpkin’s weight correctly at 75 kg, so I got to take it home. The school invited a First Nations artist to carve its face, making it by far the coolest Halloween pumpkin I’ve ever had. It’s a shame that pumpkins don’t keep, because it really was a work of art. We took lots of pictures and kept it in the window for safekeeping, because local kids loved to smash pumpkins on Halloween and such a big one would surely be a target. We never threw out our pumpkins after Halloween. My mom would always stick them in the window with flashlights instead of candles so that they would be useable later. She would then steam them, mash them, and make them into treats like pumpkin muffins. She’d also roast the seeds, which were always a treat during school snack time. The monster pumpkin got the same treatment, which meant that we had to throw most of it in the deep freezer to keep it from going bad. As a result, we had a steady supply of pumpkin for years. Whenever I made pumpkin pie for Thanksgiving or my mom made pumpkin goodies, we could just dig into the freezer. Because we always used our pumpkins after the costumes came off, and because the monster one in the freezer meant that we never had to buy the canned stuff, it always baffled me that people would buy and carve up large Halloween pumpkins, throw them out after Halloween, and then buy canned pumpkin for the rest of the season. What a waste of perfectly good pumpkin, especially considering that it was something they used anyway! So, I urge you to reuse your pumpkin this year, if you’re not doing so already. Even though the typical Halloween pumpkin doesn’t have quite as much kick as a butternut squash or a sugar pumpkin, it’s kind of hard to tell when you’re loading it with sugar and spices. The mild taste is also pretty delicious in dishes like curry and risotto. But don’t stop there — the seeds and the guts are also pretty fantastic. Roasted pumpkin seeds make a really tasty salty snack, and the guts work well in vegetable stock. You’re welcome.